Yahoo has announced MapMixer (Beta). It lets you add overlays over its base mapping layers, allows you to embed the resulting map on your own website, and then gives the user opacity controls. Here’s one user’s live example, of an old map of Singapore overlaid on Yahoo’s Singapore imagery. It lets you upload and place an overlay from within a browser. Google Maps won’t give you an opacity slider to play with for the overlay. 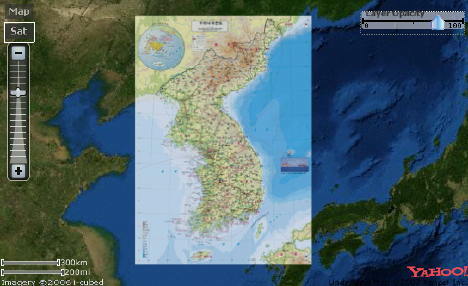 It is easier to accurately position a map than in Google Earth. With MapMixer you are asked to pin matching locations on both the base map and the overlay — much like how Microsoft’s MapCruncher works, except that MapCruncher is a Windows only application. MapMixer plays nice inside a web browser. meanwhile, as Google Earth’s built-in tool doesn’t let you correlate matching placemarks, you end up fiddling a lot. One advantage that Google does have over both Yahoo and Microsoft: An overlay made using Google Earth is exportable as KML, and that’s now a standard that both Yahoo and Microsoft will inevitably adopt. I can’t help wishing that maps made with Yahoo MapMixer were exportable as a KMZ file today, so I could use this tool to create overlays I can show in a KML-savvy client of my choice. Metacarta’s rectifier has been able to do this for a while.